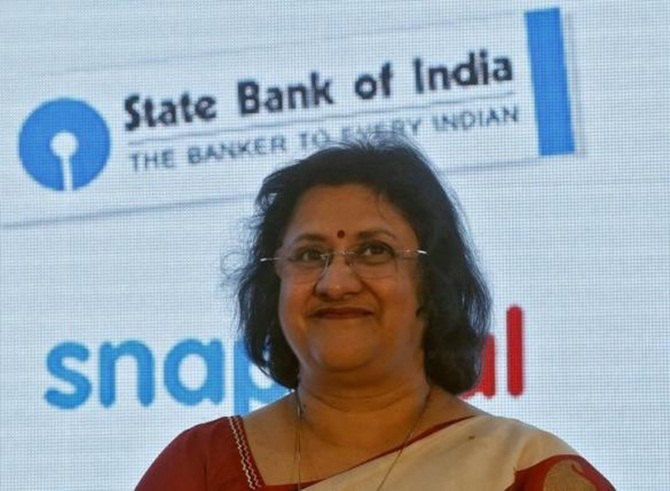 'I want to leave behind the bank stronger and better than when I took over,' SBI Chairman Arundhati Bhattacharya tells Niraj Bhatt and Abhijit Lele. Arundhati Bhattacharya looks out of the window at the sprawling vista of Mumbai's racecourse, the Haji Ali dargah on the Arabian Sea, the glitzy residential skyscrapers, and then her eyes fall on the ubiquitous blue plastic sheets that protect Mumbai's slum dwellers from rain. The most influential Indian woman on Forbes' list of The World's 100 Most Powerful Women is a voracious reader and loves listening to old Hindi and Bengali music. She is reading The Great Golden Sacrifice of the Mahabharata by Maggi Lidchi-Grassi, and says she narrated two stories from the book at a talk she gave to senior management at Larsen & Toubro earlier that morning. We are at By the Mekong, the Asian restaurant on Level 37 of The St Regis, Mumbai. Bhattacharya says while she enjoys all cuisines, she is a sparse eater. She is happy with the set menu, which has both Chinese and Thai, and we start with an assortment of appetisers. She chooses the Kung Pao chicken and steamed shrimp dumplings; we go for the Kung Pao potatoes and stir-fry vegetables. IMAGE: Bhattacharya loves listening to old Hindi and Bengali music. 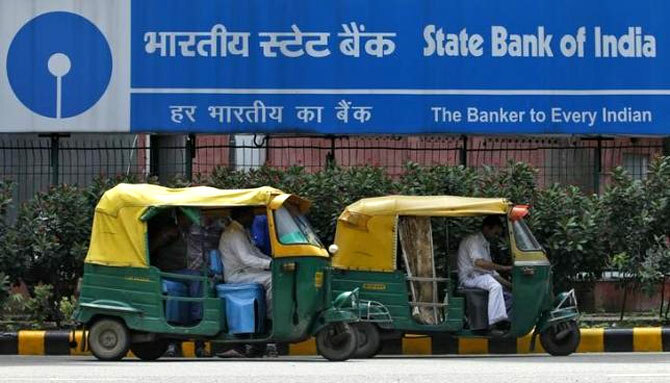 Bhattacharya was appointed chairman of State Bank of India in 2013 and has steered the bank at a difficult time, as loans to highly indebted companies became stressed or non-performing. Did she expect the environment to be so difficult? "It wasn't a surprise," she replies. "However, we did not anticipate the downturn to last this long." She says demand in India holds from the bottom. Rural demand declined due to two monsoon failures, the government's inability to raise minimum support prices as commodity prices declined the world over and lower allocations through the NREGA. Slow growth in the global economy didn't help either. The government and the banking sector have met halfway to solve the stress problem, and things are looking better, she says. On the macro side, the Seventh Pay Commission and a good monsoon should restore consumer demand. There is movement in roads, renewable power and freight corridors, and ports and airports will follow soon. Banks and Bhattacharya, as the boss of the largest corporate lender, have been putting pressure on highly indebted groups to sell assets, raise funds and repay debt, but the process has been slow for various reasons. Some of these firms did sell part of their assets, but many more have been in the pipeline for months now and are yet to bear fruit. "It's a good thing that all these deals are being talked about and some are getting done," she says. "I only hope they speed up." She is quick to add that these are big deals and take time to complete, and that promoters now understand that to get the respect of the market, they need to be less leveraged. Our next course, tom yum soup, is served. Bhattacharya, who holds a master's degree in literature, says she came into banking fortuitously. She took the entrance exam with a few friends for a lark, and got through. She had just a couple of days to pack her bags from Jadavpur University in Kolkata and go to Hyderabad for SBI's training programme. There is also an interesting story behind her decision to pursue her bachelor's in literature. Bhattacharya had secured admission in medicine, but there were problems -- hostel accommodation was not available and the course would take eight years to complete as academic sessions were being disrupted due to the Naxalite movement in West Bengal. Her father was to retire in three years, which, too, was a concern. The family consulted her school principal Father John Moore, the well-known educationist who started the St Xavier's schools in Hazaribag and Bokaro. He said she was a brilliant writer and should pursue a career in writing and journalism. She settled on literature at Lady Brabourne College, which had a 'conservative' hostel. We ask if she gets a chance to write; she says she doesn't, but looks forward to doing it in her one-year cooling period when she retires in September. Bhattacharya's name keeps coming up for key appointments, whether it is the top job at the Securities and Exchange Board of India or the Reserve Bank of India. How does she feel when she sees these reports? "I take all of this with a big pinch of salt; these are a creation of the media." Our main course of rice, noodles with stir fried chicken, Thai curry and tofu in Sichuan chilli bean paste arrives. Bhattacharya says there has never been a dull moment in her career. The system of transfers within the bank ensures there is always something to learn every day. She has had 12 different jobs in the bank across retail, corporate, treasury, human resources and investment banking. 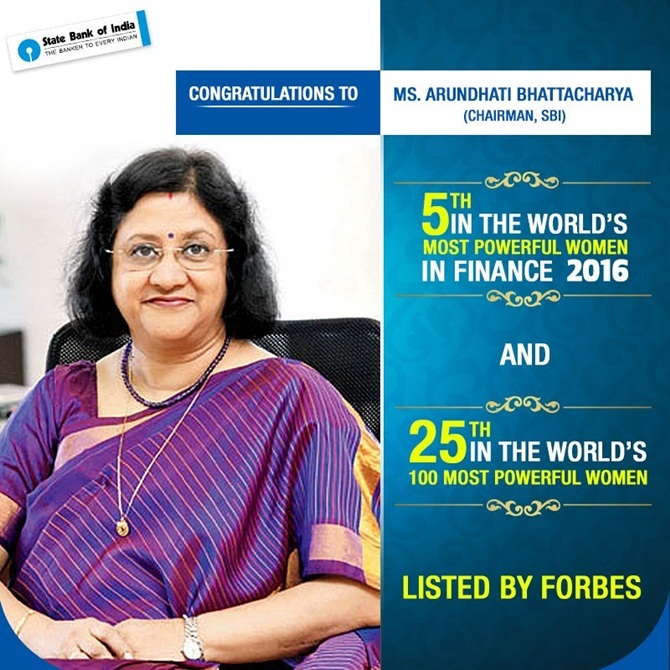 Her most challenging assignment was as branch manager at IIT-Kharagpur, where she faced resistance from an active union when the bank went for computerisation. The most exciting role, she says, was in new business development. There was no laid-down method of work and she had to take a lot of decisions on her own. She completed three joint ventures and worked on two technology platforms - net banking and financial planning. Of the lot, the only one that didn't do well was financial planning. She says this would now be rectified with the launch of the SBI Exclusif wealth management service. Even her private sector competitors are in awe of how she has transformed SBI into a smart bank with all the digital forays. SBI became the number one player in mobile banking in April 2015 and had nearly three million mobile wallet users in March 2016. It has bagged two Gartner Cool Business awards for innovation with its missed call banking app, SBI Quick, and digital branch SBI Intouch. Customer service is one area that has improved, but Bhattacharya is not satisfied. 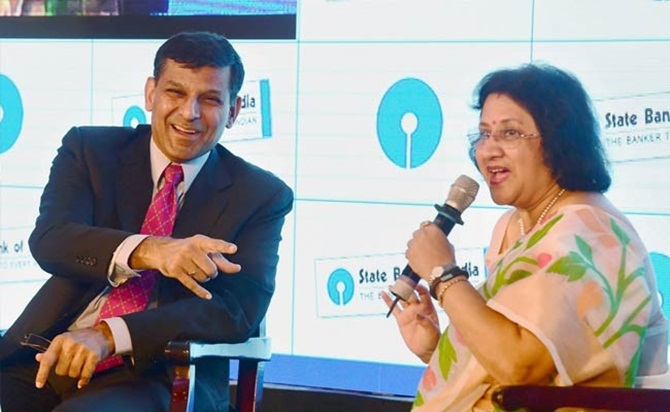 IMAGE: Her private sector competitors are in awe of how she has transformed SBI into a smart bank with all the digital forays. "We have put in a lot of effort to train them (the staff) but even then we find knowledge gaps." These typically happen in transactions that are not done often; the people in charge are not able to handle them and give the wrong answer leading to complaints. "I am disturbed about these complaints and would like to not have them." How does she make the elephant dance, we ask. SBI has the ability and the DNA to change, she says. "At SBI, we say that if you need a project to be done, you need to be determined that it needs to be done, put a deadline and it will get done." Is the perception of her being outspoken correct? Bhattacharya is quick to rebut this: "I say what is required to be said. Whatever I have said is in the interest of the system and it has never been taken amiss." 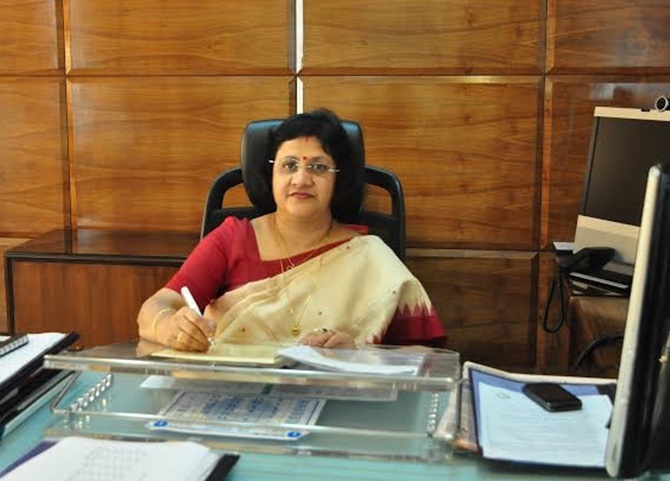 IMAGE: Bhattacharya has made it easier for women employees to work in the bank. A late sleeper and early riser, Bhattacharya reaches home around 9 pm and then tackles the paperwork from 10.30 pm to 1 am. That's also the time she helps her daughter with her studies. Things have been tough on the family. The bank has been helpful, she says. After her marriage to a professor at the Indian Institute of Technology-Kharagpur, her postings were in and around Kharagpur. After that, she was posted in Kolkata and Bhattacharya and her husband would visit each other over the weekend. When she was posted in the US, he joined her and quit IIT. After they returned to India, it has been a long-distance marriage, except for the last one year when he moved to Mumbai. 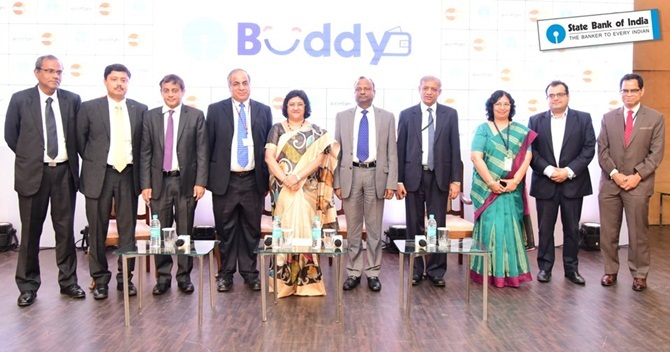 On her journey to the corner office at India's largest public sector bank, Bhattacharya says, "I have been lucky to work in one organisation (for so long); so once the reputation is set, you don't have to keep proving yourself." She says that when women move from one company to another, they have to continually prove themselves. "This is something most women face because it is difficult to convince somebody, who is very serious about his job, that you are equally serious." Bhattacharya has made it easier for women employees to work in the bank, and is working on reducing attrition. At the entry level, 37 per cent of SBI's staff are women, but the figure drops to 23 per cent at the total employee level. She says women leave the bank at three stages, typically: Around childbirth, when their children are in Class 10 or 12 and when they have to take care of an ailing parent. 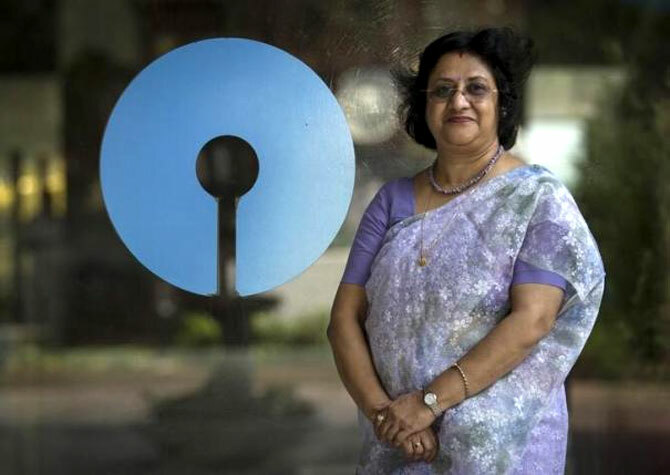 SBI has now introduced a two-year sabbatical for such women employees. The bank may also allow women to work from home for two years, she says. 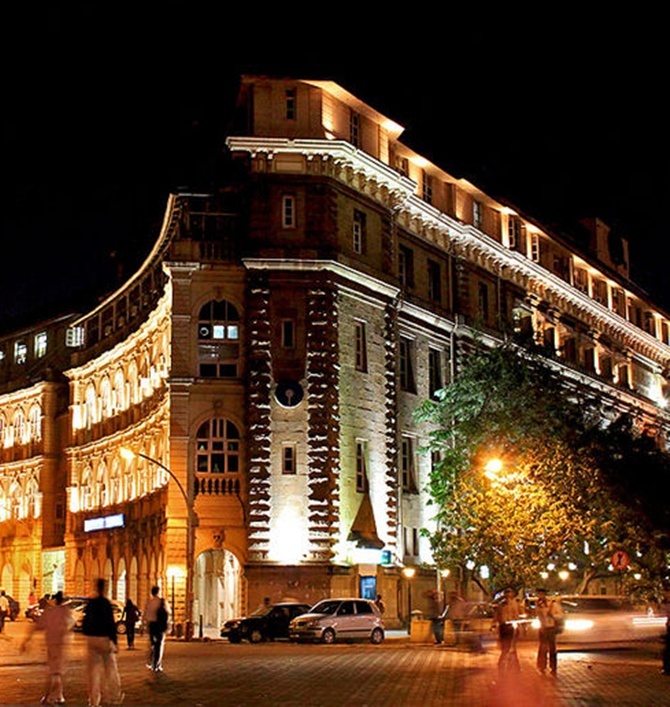 In June, SBI announced the merger of five of its associated banks and the Bharatiya Mahila Bank with itself. The merger will happen later this financial year. A challenging task, there is speculation that the government may want Bhattacharya to see it through, and hence the chatter of her extension. Our dessert is nearly over, and we ask how she feels to be on the power list. She laughs: "It's good to be on the power list, but I don't see a practical use of it except when people introduce me to audiences." 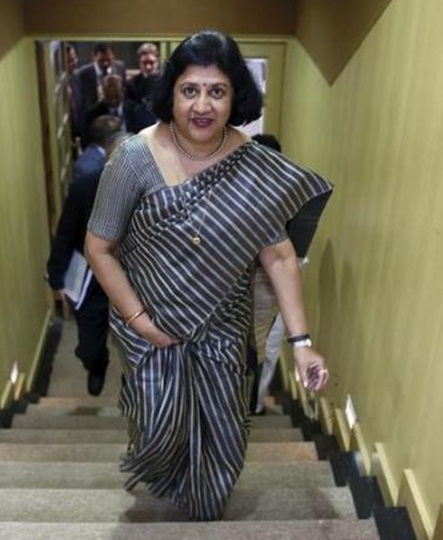 What is the legacy she would like to leave at SBI? "I want to leave behind the bank stronger and better than when I took over."